Sir Elton John is hanging up his tour clothes after one big farewell trek. The 70-year-old rocker announced the news at a press conference in New York on Wednesday (January 24), and told CNN's Anderson Cooper he'll spend the next three years saying goodbye to fans on a world tour. The Rocket Man singer explains he wants to spend more time with his husband David Furnish and their two young sons after spending almost 50 years on the road. It is not clear if his Las Vegas residency will continue after his farewell tour, but sources close to the rock star insist he'll still record and perform. 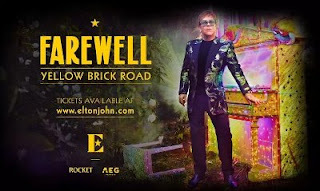 The 300-plus date Farewell Yellow Brick Road Tour kicks off in North America in September and will include dates on five continents. Confirming the news, Elton says, "Performing live fuels me and I'm ecstatic and humbled to continue to play to audiences across the globe. I plan to bring the passion and creativity that has entertained my fans for decades to my final tour. After the tour finishes, I'm very much looking forward to closing off that chapter of my life by saying farewell to life on the road. I need to dedicate more time to raising my children." It was also announced that Gucci designers will exclusively create Elton's Farewell Yellow Brick Road Tour wardrobe. The rocker wore a bespoke outfit as he announced the news at Manhattan's Gotham Hall, explaining many items were inspired by his own style archives.